After an August when I deserted not just Yellowstone but left the country for a trip to Germany, France, and Switzerland, I am back picking up my research project where I left off. This project will, with luck, turn into a new biography of Philetus W. Norris, Yellowstone’s second and most dynamic superintendent, who served from 1877 to 1882. There is much to learn about Norris, including reading his several reports as superintendent. His only other extensive published work, unless you include the letters he sent to the Norris Suburban newspaper, is a book of annotated poems called Calumet of the Coteau. The book’s title refers to a peace pipe and the French word for hill or hillside. I have quoted two of his poems in my historical anthology, Through Early Yellowstone: “Rustic Bridge and Crystal Falls” and “The Wonder-Land.” Norris’s unfailing use of iambic tetrameter or pentameter can get monotonous, but the sentiments are nice. And bright-spouting geysers of lone Wonder-Land. Those cloud-circled mountains, white-crested with snow! Read more about my trip to Europe in the nuggets Savoring France, Part I and Part II. Photo credit: Record Group 79, National Archives and Records Administration, Yellowstone National Park. The Gate of the Mountains by Albert Hencke (1865-1936), originally published in 1893 in Outing magazine. Click for a larger version. 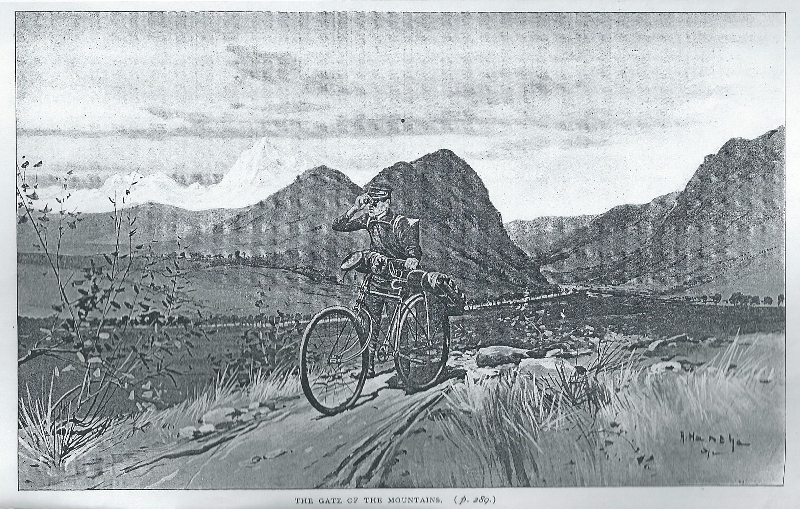 This month Dave Iltis of Cycling Utah decided to reprint Janet Chapple’s annotated version of “Lenz’s World Tour Awheel” in its entirety in the late summer issue of their magazine, Cycling Utah / Cycling West. Cycling Utah has been providing cycling news, information and events in the western United States since 1993. Dave bought the book in the shop at the Old Faithful Visitor Education Center and decided that the charming adventure story deserves wide readership among bicycle riders. You can even get the whole magazine issue as a free download from that website. I was congratulating myself upon having passed through the most uncomfortable portion of my trip when I espied it raining on the opposite side of the river, and soon the icy-cold spray reached me. When within half a mile of a government engineer’s camp, what was my surprise to see the rain change into snow. As it blew up quite strong. I made for the cook’s tent for shelter, and here for three hours I thawed out my fingers and feet, which were nearly frozen. Lenz’s story is one of the highlights of our enjoyable anthology, Through Early Yellowstone: Adventuring by Bicycle, Covered Wagon, Foot, Horseback, and Skis. Other highlights, according to Aaron Parrett’s Montana book roundup in Montana: The Magazine of Western History, include Nathaniel P. Langford’s 1871 “Wonders of the Yellowstone,” Margaret Andrews Allen’s “A Family Camp in Yellowstone Park” (1885) and the journalist Ray Stannard Baker’s “A Place of Marvels: Yellowstone Park As It Now Is” (1903). You can read this and other reviews to learn more. If you are interested in the shoulder seasons for cycling in the park, see the National Park Service’s Spring & Fall Bicycling page. Sorry to say, I *did* leave out at least one of Lee’s books about Yellowstone in my tribute to him. In 2007 he published Storytelling in Yellowstone: Horse and Buggy Tour Guides, a great contribution to lovers of the park. The book contributes a lot to our knowledge of the men who spread their expertise—usually gained from long experience and exploration—to visitors they led around the geyser basins or escorted around the park. Reviewing just now the “Bibliographic Essay” of this book, I am proud to come across these sentences: “Yellowstone guidebooks (the first one appeared in 1873) are legion. Janet Chapple’s Yellowstone Treasures (Providence: Granite Peak Publications, 2002) is my recent favorite in this category. I’d like to follow up on the delightful biography of Park Historian Lee H. Whittlesey, posted by Liz Kearney on May 30th on the Yellowstone Insider website. Lee retired a month ago from his long-held position and gave up his office in the Yellowstone Heritage and Research Center building. Every time I’ve been in the park since 1995, I’ve asked Lee for a visit, which he has kindly granted. Lee has been essential to every bit of the research and writing I’ve done there. I remember the first time I timidly asked to interview him with one of the endless lists of questions I generate between my yearly (or sometimes more frequent) visits to the park. From our first visit on, he put me at ease and directed me to all the sources I’ve needed. I find it hard to think of continuing my Yellowstone research without the rock-solid assistance of Yellowstone’s fabulous historian. Here is a list of his books and National Park Service publications that I own. I may be missing some—but I hope not. Yellowstone National Park, Images of America series: largely, historic photos with detailed captions (2008). I will remain in contact with Lee for as long as possible. He has planned a “retirement” full of the writing projects he has not yet had time to complete. Why is Yellowstone National Park important? Comments Off on Why is Yellowstone National Park important? The superficial answer might be simply: It is important because it was the first place called a national park ever set aside by any country. In answering this question one would have to ask two others: Important to whom? and Important in what way or ways? Important to whom? Well, to anyone who cares about preserving remarkable landscapes from commercialism or from being despoiled. In 1872, when Congress passed the act setting aside the park and President Ulysses S. Grant signed it, the Yellowstone area was compared to Niagara Falls, because that phenomenon had not been preserved officially nor were businesses forbidden from setting up to sell whatever they wanted to the tourists who flocked there. How was it important? Although no one in Congress had seen this remote western area, the men who had gone there were able to show photographs and paintings and tell them stories of what they had seen—phenomenal geysers and hot springs, lakes and waterfalls, mountains and valleys teeming with wildlife. Not only Americans but people from all over the world are now able to visit and experience a place like no other, where only the necessary concessions are permitted and noone is trying to sell you anything outside of the few souvenir shops you may enter if you wish. 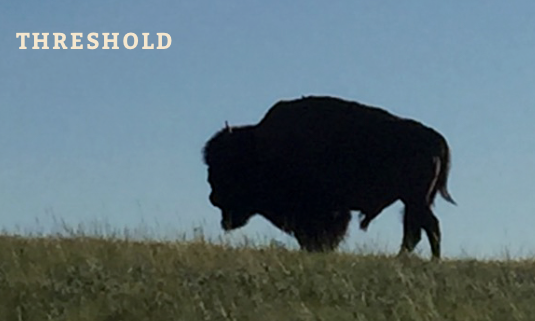 Broad and beautiful Hayden Valley is where today’s visitors are most likely to see herds of bison close to—or on—the road. The valley is named for Dr. Ferdinand V. Hayden, born on September 7, 1829. He played a large role in the creation of Yellowstone National Park. Trained as a medical doctor at Albany (NY) Medical School, Hayden served as a surgeon in the Union Army until 1865. However, he became interested in geology through collecting and studying fossils in the Dakota Territory and in 1867 began his government-supported geological surveys of the west. During the summers of 1871, 1872, and 1878, the Hayden Survey studied the Yellowstone area systematically. The men observed and reported on many geological and other phenomena in voluminous reports. 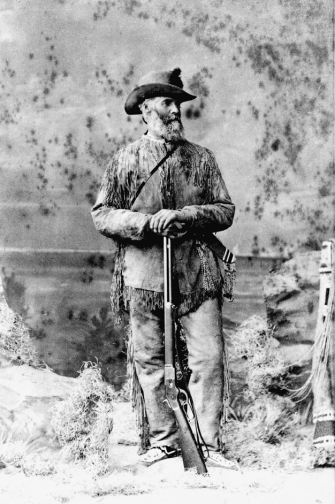 The report of Hayden’s first exploration was essential in convincing Congress to establish YNP in 1872. Having returned from my Yellowstone trip several weeks ago now and not expecting to be able to go again this year, I’m reduced to reading all I can find about the park in order to keep current. 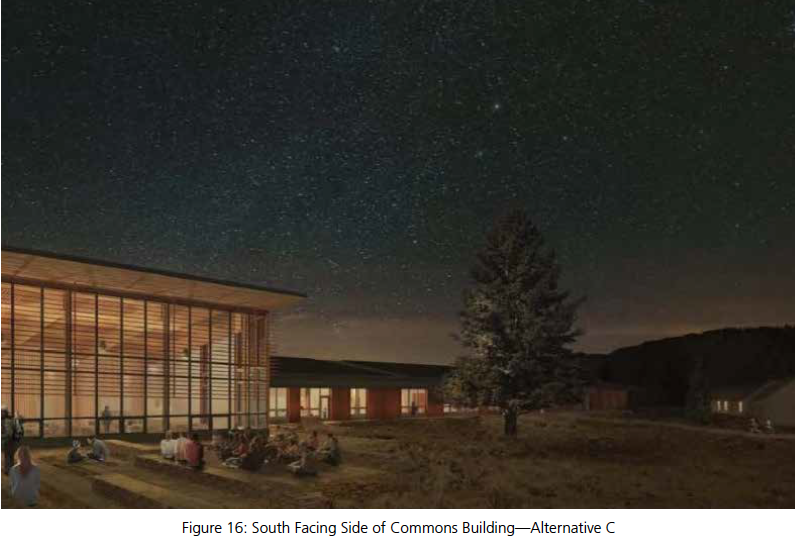 I’ve just read some of the National Park Service’s Environmental Assessment for the proposed Youth Campus. I hope that Alternative C will be built on the land where the Mammoth Horse Corral was formerly located. Of course, I don’t know for sure that this is going to happen, but I am trusting enough to mention it in Yellowstone Treasures’ Fifth Edition (pages 269–70). The proposal would bring as many as 140 young people to work and enjoy the park each summer and house them in lovely modern surroundings while they are there. Being concerned that the important historical features in the area should be carefully preserved, I just sent a comment to that effect. I included a suggestion that a separate access road and small parking area be available for visitors to the small (formerly military) cemetery started there in 1888. Although the soldiers’ graves have been relocated elsewhere, the cemetery is still a beautiful spot and should be carefully preserved for posterity. Here is an entertaining link to a Yellowstone Insider post I am happy to pass on. I did not know about this place with the unusual name and will surely try to stop there when I pass through Silver Gate to enter the park through the Northeast Entrance next month. The Beartooth Highway and Chief Joseph Scenic Byway are both beautiful ways to reach the newest entrance to Yellowstone. The former opened in 1936, and the latter was fully paved only in the 1990s. My iPhone shot shows a page from the August 11, 1888 Graphic. 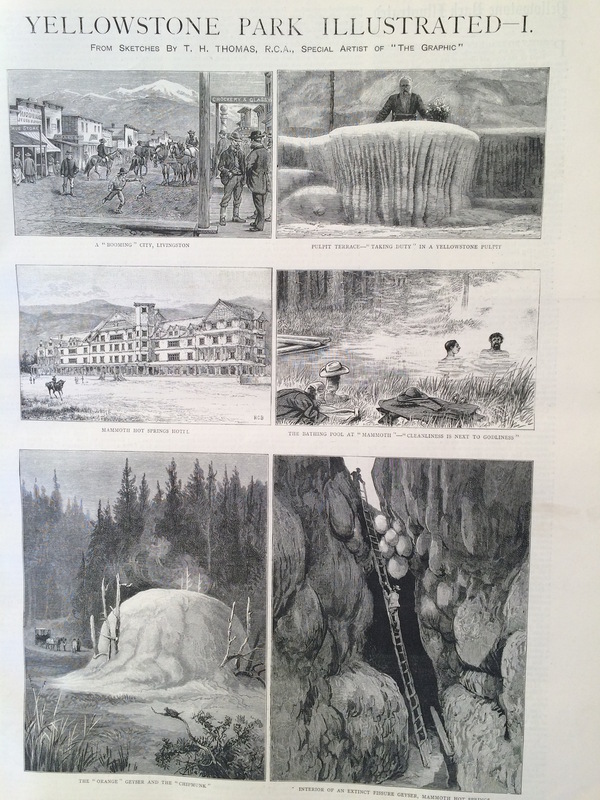 You see three scenes engraved from photographs: Livingston, Montana; Pulpit Terrace at Mammoth; and the Mammoth Hot Springs Hotel. One engraving is from a pencil sketch and two from watercolors: Bath Spring, Orange Spring Mound, and the interior of Devil’s Kitchen. Today is the one-hundred-seventy-eighth birthday of Thomas Henry Thomas, the author and artist featured at the center of my 19th century collection, Through Early Yellowstone: Adventuring by Bicycle, Covered Wagon, Foot, Horseback, and Skis. In 1884, you could travel around the new national park either by horseback or by horse-drawn coach. Thomas chose to ride. He wrote to a friend in his native Wales that he painted “quite half, if not more” of his watercolor sketches from “the logger-head of the Mexican saddle of my Cayuse.” In Through Early Yellowstone you can see 26 of his watercolors and one pencil sketch, none of which have ever been seen outside of Wales. Born in 1839 in Pontypool, Wales, Thomas studied art at the British Royal Academy and also in France and Italy. His online biography does not tell us where he learned to write with his special combination of erudition, grace, and humor. He spent most of his life in Cardiff, Wales, where he pursued many interests besides art, including archaeology, geology, and Welsh folklore. He served as artist to the London Graphic, a large-format publication with 16- by 12-inch pages. It took four years for the Graphic to turn some of Thomas’s Yellowstone watercolors and collected photographs into engravings. The first page of one of his two articles for the magazine is shown above. Before Thomas died in his mid seventies in 1915, he bequeathed more than one thousand prints, drawings, and watercolors to the National Museum of Wales (Amgueddfa Cymru in Welsh), of which he was a founding father.